Little slabs of steel, malady plasma-cut and and grinder-shaped by hand. Peter Atwood makes rock-solid finger tools. ‘Nuff said. This one’s good for prying open paint cans and yanking stubborn nails and splitting things and opening beers. 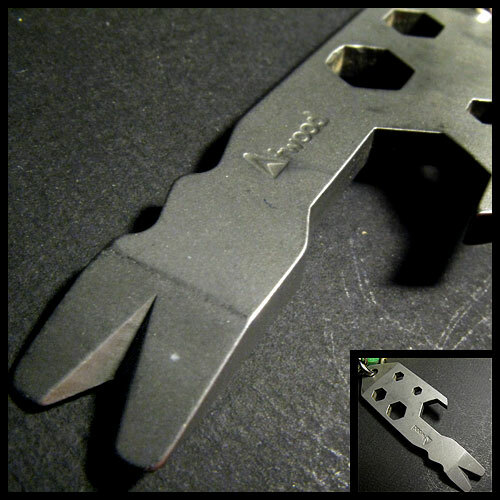 Coupled with the Leatherman and the chain mail, it makes my keyring a nasty fistful of metal. Which is fun to lug around most of the time but has to be stripped of anything useful (beyond keys) before it’s shown to the TSA. I have yet to run into tiny nuts that need turning, but perhaps that’s because I haven’t given myself an excuse to do so. I use this thing all the time.